‘Bei Mir Bistu Shein’ was originally constructed to be part of a Yiddish operetta called I Would If I Could and was written in 1932 by Abraham Bloom with music by Secunda and lyrics by his writing partner, Jacob Jacobs. Translated as “To Me You’re Beautiful,” the original song was based on a dialogue between two lovers and was initially a big hit in Nazi Germany until its Jewish origins were discovered, at which point it was promptly banned! The trio had attempted to sell the show to Hollywood, but with no success or greater prospects on the horizon, Secunda and Jacobs decided they might as well sell the rights to a publisher for a mere thirty dollars in 1938…which, had they had a time machine, they may have thought twice about!! Within two months of the sale, a then-little-know musical trio called the Andrew Sisters recorded a newly adapted English-language version of the song. The track was presented with new lyrics by Sammy Cahn and Saul Chaplin,with the only Yiddish that remained was the title, which was repeated throughout the song. Released by Decca Records, it became the Andrew Sisters’ first major hit record, generating revenues that Secunda and Jacobs could only dream of! 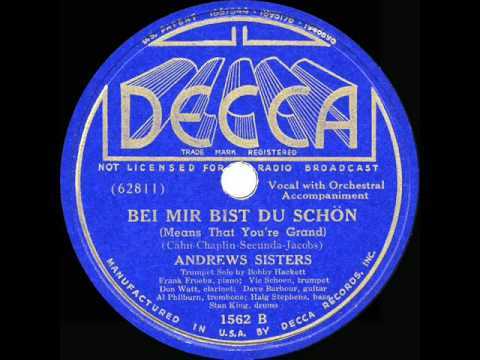 Though there have been many versions of this song recorded (another favourite is Ella Fitzgerald’s rendition), The Andrew Sisters’ cover is my favourite! Their close harmonies and swing/boogie-woogie sound is something else and not only that, I was impressed to discover just how their vocals are still so very influential today. Artists like Bette Midler, Christina Aguilera, Pentatonix and many others have copied and recorded songs by The Andrew Sisters and, just another random fact, in 1998 one of their recordings featured in an episode of the X-Files!…and another great version is when the sisters joined up with Glenn Miller, check that out here and listen above. This entry was posted in Big Band, Jazz, swing and tagged Big Band, Decca, Jazz, swing. Bookmark the permalink.